Take care of all your drilling essentials with a Ryobi 18V ONE+ 1.3Ah Hammer Drill Kit. They'll help make light work of every home improvement project. The battery and charger fit in as part of our smart ONE+ range, which brings more than 70 power tools together under the same battery platform. That means you get more value for your money, and more versatility from your batteries and chargers. The drill driver in this drill kit offers you enough power for those daily jobs around the house, so you'll never be caught out when you need to create a hole or drive a screw into place. Do you want a handy kit that is perfect for both beginning handymen and seasoned DIYers? Call or visit your local Bunnings Warehouse to find these 18V drill kits, along with many other quality Ryobi tools and hardware. One battery powering over 40 tools. 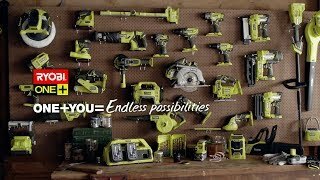 The RYOBI 18V ONE+ System has more than 40 tools that work with the same battery platform, giving you the ultimate versatility in tool selection to get your job done. You can get more done in less time and improve the performance of every RYOBI 18V tool ever made. No matter how you add it up, ONE+ is the one system that delivers more.